Is Chiropractic Care Essential to Child’s Spinal Development? Why Chiropractic care is essential to your child’s spinal development. Is chiropractic really essential to spinal development? Of course the answer is unequivocally no. I can say that without reservation because there’s no data to support such a statement. As far as aligning the spine goes, well, we can’t support that statement either. This is the kind of stuff that chafes my tuchus. Don’t get me wrong, there’s some good stuff in this article. Kids can benefit from chiropractic care just as adults do and we can educate on the importance of good posture, body mechanics and ergonomics. But don’t promulgate such innuendo as; chiropractic care is essential to your child’s spinal development. If your child complains of back or neck pain a chiropractor is qualified to assess, differentially diagnose and treat them. Some chiropractors will go a step further and tell you they can treat other ailments other than musculoskeletal problems and there is some anecdotal evidence of that. That’s OK as long as you are made aware of the anecdotal level of evidence and you are still willing to try it. Most pediatricians will not recommend chiropractic care, likely because they have no clue as to what we do. What they likely do hear from their patient’s parents is all sorts of healing claims and of course that doesn’t sit well with them either. Chiropractors can help a lot of folks out there but the MD gets too much hyperbole feedback from their patients about chiropractic care claims and simply writes us off much of the time. For good spinal health and development, in my opinion, children must be taught good spinal hygiene (mobility maintenance – posture – body mechanics – ergonomics) early on, just like dental hygiene training. 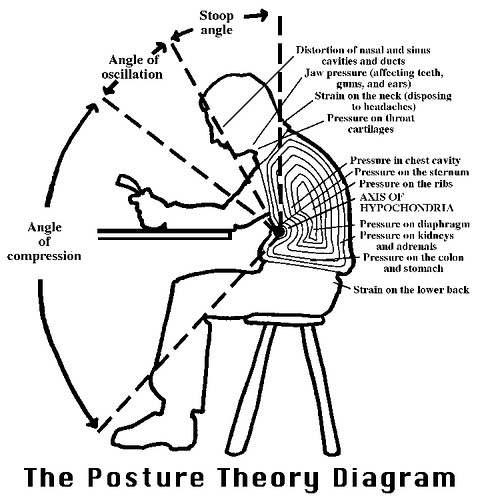 The article below discusses the psychosocial element of posture pain. 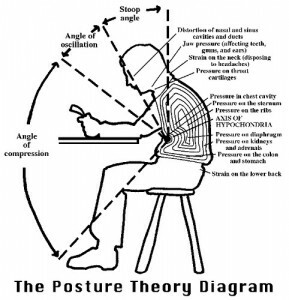 Let me assure you there’s a direct cause & effect associate with the mechanics of poor posture as well. Be mindful of your posture! Mothers have been telling their children to stop slouching for ages. It turns out that mom was onto something and that poor posture not only makes a bad impression, but can actually make you physically weaker. According to a study by Scott Wiltermuth, assistant professor of management organization at the USC Marshall School of Business, and Vanessa K. Bohns, postdoctoral fellow at the J.L. Rotman School of Management at the University of Toronto, adopting dominant versus submissive postures actually decreases your sensitivity to pain. The study, “It Hurts When I Do This (or You Do That)” published in the Journal of Experimental Social Psychology, found that by simply adopting more dominant poses, people feel more powerful, in control and able to tolerate more distress. Out of the individuals studied, those who used the most dominant posture were able to comfortably handle more pain than those assigned a more neutral or submissive stance. Wiltermuth and Bohns also expanded on previous research that shows the posture of a person with whom you interact will affect your pose and behavior. In this case, Wiltermuth and Bohns found that those adopting submissive pose in response to their partner’s dominant pose showed a lower threshold for pain. While most people will crawl up into a ball when they are in pain, Bohn’s and Wiltermuth’s research suggests that one should do the opposite. In fact, their research suggests that curling up into a ball may make the experience more painful because it will make you feel like you have no control over your circumstances, which may in turn intensify your anticipation of the pain. Instead, try sitting or standing up straight, pushing your chest out and expanding your body. These behaviors can help create a sense of power and control that may in turn make the procedure more tolerable. Based on previous research, adopting a powerful, expansive posture rather than constricting your body, may also lead to elevated testosterone, which is associated with increased pain tolerance, and decreased cortisol, which may make the experience less stressful. While prior research shows that individuals have used pain relievers to address emotional pain, it is possible that assuming dominant postures may make remembering a breakup or some distressing emotional event less painful. Simvastatin that marketed as Zocor from Merck pharmaceutical company is statin drug to control elevating cholesterol levels. Million of people has prescribed with this drug without ‘respecting’ to the side effects, both in due to the doses and combination with other drugs. As growing evidence has linked to this drug with the development of myopathy and rhabdomyolysis, now the U.S. Food and Drug Administration (FDA) just start to warns and recommends for simvastatin use. Although this decision seem ‘late respond’ as some of previous study has suggested this relationship, however it still useful for remain or candidate patients due to use of simvastatin drug. The agency recommend to the physicians to limit the use of simvastatin 80 mg and warning in combination with other drugs. However, for patients who already taking the drug for 12 months and no indication linking to myopathy, then the drug may prescribed with precautions. Also, the FDA request to the pharmaceutical company to change drug’s label as above mention including the warning for drug combination with other medications. This warning and recommendation based on the Study of the Effectiveness of Additional Reductons in Cholesterol and Homocysteine (SEARCH). Based on SEARCH study results, there were myopathy development in 52 patients taking simvastatin 80 mg and 1 patient taking simvastatin 20 mg.
Also, compared with patients whose taking 20 mg dose of simvastatin, rhabdomyolysis also occurred in patients taking 80 mg dose. Both of risks at higher rate in the first year, and older people and female are at significant risk. Atherosclerosis, also called hardening of the arteries, occurs when particles of LDL cholesterol stick to the walls of the arteries. Eventually these particles build up and form plaque. This plaque narrows the blood vessels and increases the work load of the heart in an effort to get oxygenated blood to the entire body. The result can be a heart attack or stroke. Olive oil is rich in monounsaturated fat and antioxidants like chlorophyll, carotenoids and vitamin E. Scientists have identified a compound in olive oil called oleuropein which prevents the LDL cholesterol from oxidizing. It is the oxidized cholesterol that sticks to the walls of the arteries and forms plaque. Replacing other fats in your diet with olive oil can significantly lower blood pressure and reduce the risk of heart attack. A study published in the January 2005 issue of Annals of Oncology has identified oleic acid, a monounsaturated fatty acid found in olive oil, as having the ability to reduce the affect of an oncogene (a gene that will turn a host cell into a cancer cell). This particular oncogene is associated with the rapid growth of breast cancer tumors. The conclusion of the researchers was that oleic acid when combined with drug therapy encouraged the self-destruction of aggressive, treatment-resistant cancer cells thus destroying the cancer. Olive oil has been positively indicated in studies on prostate and endometrial cancers as well. Unlike other fats, which are associated with a higher risk of colon cancer, olive oil helps protect the cells of the colon from carcinogens. A study published in the November 2003 issue of Food Chemistry Toxicology suggests that the antioxidants in olive oil reduce the amount of carcinogens formed when meat is cooked. Diabetics or those at risk for diabetes are advised to combine a low-fat, high-carbohydrate diet with olive oil. Studies show this combination is superior at controlling blood sugar levels compared to a diet that consists entirely of low-fat meals. Adding olive oil is also linked to lower triglyceride levels. Many diabetics live with high triglyceride levels which put them at risk for heart disease. 100 Million Plus in Chronic Pain in U.S.
WASHINGTON — Chronic pain affects 116 million Americans and costs the U.S. as much as $635 billion each year, according to a new report from the Institute of Medicine (IOM) that called for changes in how chronic pain is managed. Much of the chronic pain experienced by Americans isn’t treated correctly, in part because doctors are not taught in medical school how to help patients manage pain, according to the report, entitled “Relieving Pain in America: A Blueprint for Transforming Prevention, Care, Education, and Research,” which was mandated by the healthcare reform law. Chronic pain is so widespread and poorly understood that it’s a public health issue and a major “national challenge,” concluded the Committee on Advancing Pain Research, Care, and Education, which was made up of 18 experts in pain management, anesthesiology, bioethics, statistics, and immunology. “Given the large number of people who experience pain and the enormous cost in terms of both dollars and the suffering experienced by individuals and their families, it is clear that pain is a major public health problem in America,” said committee chair Philip Pizzo, MD, professor of microbiology and immunology at Stanford University School of Medicine, in a press release. Chronic pain is “more than a physical symptom” and can be influenced by genetics, stress, depression, and behavioral, cultural, and emotional factors, the committee wrote. Moreover, long-term, persistent pain, which may have been caused by an injury or a disease, can cause changes in the nervous system, which in turn cause the pain to become its own distinct chronic disease. The report called for a cultural change in order to prevent, assess, treat and understand all types of pain and laid out a blueprint for providing relief from pain. It directs the Department of Health and Human Services to develop a plan to increase awareness about pain and its health consequences; improve how pain is assessed in the healthcare setting and how treatment of pain is paid for by the federal government; and to address disparities in how different groups of people experience pain. It also called for the National Institutes of Health to designate a lead institute tasked with “moving pain research forward,” and it called for coordinated efforts between public and private organizations to create recommended changes to how chronic pain is managed. The committee said that while pain is prevalent, the full scope of the problem is unclear, especially among groups of people where pain might be underdiagnosed and underrated, including minorities, women, children, the elderly, military veterans, and people who are at the end of life. More data should be collected to study trends over time and to pinpoint certain populations at risk for chronic pain, the committee wrote. The panel offered some advice for doctors as well: Primary care physicians should collaborate with pain specialists in cases where a patient’s pain persists even after treatment. The committee acknowledges that healthcare providers need to be better educated about how to understand pain and its causes, especially primary care doctors who are often the first stop for patients seeking treatment for chronic pain. The report recommends healthcare providers engage in continuing education programs, and that licensure, certification, and recertification should include assessment of providers’ knowledge of pain management.